(Pronounced pooh-err). These aged teas have been highly favored by the Chinese for centuries. They are now beginning to be known by other tea connoisseurs. Because of their unique manufacturing steps, the enzymatic process continues as the tea ages, which improves the flavor over years. This is the only type of tea whose value goes up as it ages. The flavors range from very earthly with an almost truffle-like appeal to sublimely fresh tasting. These teas have liquors (a technical term that tea tasters use to refer to the finished product, the extract of tea) that vary from golden to dark brown. Twelve Winds Tea Company aged pu-erh teas are exclusively from the Yunnan Province, which is the very birthplace of tea. 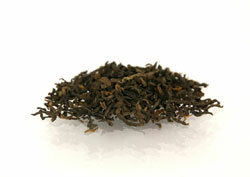 The Chinese call the pu-erhs "black teas" because of their deep, burnt amber colored liquor. What Americans label black tea the Chinese call "red tea". 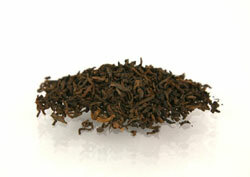 This is a full-bodied, rich, earthy tea with a hint of sweetness at the finish. 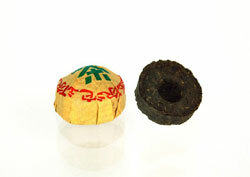 This is another high grade pu-erh with a very dark amber cup. Its earthy aroma comes with a full rich mellow taste that has a sweet finish. In the shape of a tiny hummingbird nest, this tea is several years old and is individually wrapped in paper. It has a very earthy, mushroom-like or fresh hay-like, or barn-like fragrance and flavor.